Poor Colin Trevorrow; he comes off a popular indie film, Safety Not Guaranteed, to direct a giant studio tentpole like Jurassic World that makes over $1.5 billion worldwide but generates a mixed response from audiences, only to then return to indie filmmaking with an even worse response from critics, and even calls for him to be booted off his next high-profile gig, which happens to be the next Star Wars film. It must be especially heartbreaking for the director, when in interviews he not only seems to be a really nice guy but also clearly has his heart in the right place when telling his story this time round. The problem is, that story is of The Book of Henry, which is impossible to execute perfectly because the script – written by novelist Gregg Hurwitz – is extremely problematic, to say the least. The story starts off being about young child prodigy Henry (Jaeden Lieberher), who lives at home with his younger brother Peter (Jacob Tremblay) and his mother Susan (Naomi Watts), who happily lounges about the house playing video games while Henry does her taxes. At first, it seems to be this quirky and semi-charming family drama, until several plot threads are introduced that take the movie into several unexpected, and not necessarily sane, directions. It turns out that next-door neighbour Christina (Maddie Ziegler) is being abused by her step-father Glenn (Dean Norris), who also happens to be the police commissioner, and when Henry’s calls to the authorities fall on deaf ears, he devises a plan to eradicate the danger once and for all… and unlike a lot of reviews that spoil the twists simply because they didn’t like the film at all, the details of said plan and the events happening alongside it will remain something of a secret in this review, but rest assured that you will find a lot of it rather questionable, both in the film itself and in the script that brought it to existence. This is a film that wants to be several different things – a family drama, an after-school special on child abuse, a medical tearjerker (again, no spoilers here), and a dark thriller – but none of them mesh well together at all. Aside from writing a few episodes of the 2011 V reboot, Hurwitz hasn’t written a whole lot of film scripts (in fact, The Book of Henry is his first feature writing credit according to IMDb), and his inexperience really shows in his attempt to stitch all these loose plot threads into one collective narrative, but not only do they feel like they’ve been copy-and-pasted from completely different scripts, but they create a tonally-inconsistent mess that shifts its focus and attention more than a child with ADHD. Hurwitz hasn’t seemed to have settled on what he wants his story to actually be about, which is puzzling considering that this particular script has been floating around for nearly twenty years, and in that time neither he nor anybody else took another look at it and thought that it could do with a revamp. The choices that are left in the final film are, to put it mildly, extremely misguided and purely nonsensical, something that only someone in the 90s – the era that gave us similarly insane ideas such as Pokémon, the Y2K phenomenon, and letting Joel Schumacher direct a Batman movie – could come up with and at the time think were genuinely good ideas. Again, Trevorrow is seriously not the one to blame for this movie getting the critical mauling it’s been receiving. Sure, he may have neglected the fact that Hurwitz’s script is troublesome and needed someone to step in and rework it before cameras started rolling, but his passion for even the most insanely-plotted script such as this is felt in every scene. He directs his actors very well and gets some legitimately good performances out of most people – even more so, it should be said, than Jurassic World in my opinion – and the scenes where the script dictates it goes all-out in its emotional moments, he executes them as effectively as he can, at the expense of coming across as way too sentimental or maudlin at times. The Book of Henry may have a lot of problems, but Colin Trevorrow’s direction seriously isn’t one of them. However, one problem that I personally do have with this movie is the way it handles the whole child abuse subplot, and how it seriously undermines the real-life damage and impact in a rather harmful way. Christina, the girl at the centre of this whole subplot, is given absolutely no character or even a scene of her own to explore how she’s really feeling; it’s all from the perspective of the people next door, who assume that there’s something going on just from watching the action from their windows, which means the movie never gives us a clear point-of-view from the person who’s actually experiencing this abuse (or at least I assume it’s abuse, because the film never shows us what Dean Norris’ character actually does to her). If you’re going to make a film where child abuse is one of the main plot threads, if not the main plot thread (though with this script, it’s easy to confuse which one is which), then you need to at least let the audience have an understanding of the emotional trauma and depression that the victim is going through, which this movie fails to do in any capacity, making it a rather spectacular failure of an examination into this heavy topic. There’s so much else about this movie that I haven’t even gotten around to covering yet, from Sarah Silverman’s character who takes a dive into alcoholism which is almost never brought up again, to an extremely nonsensical version of the “giving instructions via cassette tape” trope that defies logic and makes the person giving the instructions look like a friggin’ psychic, but while The Book of Henry is definitely an utter mess of a movie, and technically can be considered a bad one, it’s immature and unfair to place all the blame on its director. Instead, blame the writer for coming up with such a convoluted and borderline insane script that prevents even talented filmmakers and actors from doing their job perfectly, and does not have a foot in any kind of reality where all these mad ideas can actually come together and work. 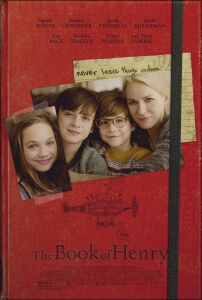 The Book of Henry is certainly as misguided and borderline insane as you’ve heard it to be, but none of the blame should be placed on director Colin Trevorrow, who does his best to make even the most nonsensical scenes feel strong, and instead should be placed on writer Gregg Hurwitz who tosses so many plots into one script, including a woefully mishandled child abuse plotline, that he ends up creating a convoluted and utterly tone-deaf mess of a narrative.